William was the fifth and youngest son of John Fettiplace, citizen and draper of London and Lord of the Manor of East Shefford (Berkshire), by his wife, Joan Fabian, widow of Alderman Robert Horne. His father died when he was a toddler. He would have been brought up in East Shefford & Antwicks at Letcombe Regis by his mother and and step-father, John Estbury. 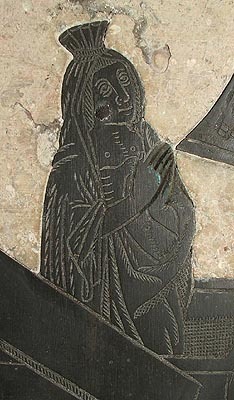 William resided at Letcombe until 1480 when he married the great Berkshire heiress, Elizabeth Waring. From her father, Thomas Waring, she inherited the manor of Erleigh Court (alias Earley St. Bartholomew) along with the minor manor of Pauntons (Earley). From her mother, Joan the daughter and heiress of Thomas Walrond, she inherited Rampanes Manor in Childrey. Though still young, she was already the widow of John Kentwood of Kentwood (Tilehurst). The couple moved into the manor house at Childrey, where William had a new porch and north-east wing built of wattle above a stone lower storey. They are the oldest parts to have survived in the current building. William was now just as affluent as his brothers, Anthony and Sir Thomas, but, like his eldest brother, Richard, was disinclined to mix to any great extent in public affairs. William's interests were of a charitable nature. The whole of his life was spent in the same neighbourhood, attending to the wants of his tenants and dependents and rebuilding the tower and generally repairing Childrey Church. In 1515, he even set up a boys' school in the village and his private chaplain became the first schoolmaster. Elizabeth Fettiplace died on 14th January 1516 and was buried in the south transept of Childrey Church. Six years later, a muster roll shows that, as well as owning Rampanes Manor, William was steward of the adjoining Maltravers Manor on behalf of Sir John Veysey who lived in Dorset. He could muster three tenants and six servants armed with three billhooks and five bows, as well as providing six pairs of harness from his own manor, along with four tenants with two billhooks from Maltravers. Not a well equipped home-guard, but it was not a time of wars on English soil. William died on 26th December 1528 and, by his will, bequeathed, to the Provost and scholars of Queen's College Oxford, lands in Letcombe Bassett, Hendley, West Shefford, Bockhampton, Lambourn, Hurst, Finkesley, Beedon, Stanmore, Woolstone, Earley, Westcote, Sparsholt, Childrey, Grove, and Uffington, on condition that they endow a chantry to his memory with a priest, who would also act as master at the school and be assisted by three almsmen (or bedesmen). They lived in Chantry House (now Cantorist House) and the little windows of the almsmen's rooms can be seen overlooking the churchyard. The chantry chapel, dedicated to the Holy Trinity, the Virgin Mary and St. Katherine, was established in the church's south transept where William was buried beneath a fine monumental brass showing him and his wife rising from the grave! The whole building was refurbished with angelic corbels and stained glass windows featuring the Fettiplace arms, as well as a painted board showing William's ancestry, to which the priest could refer to remind him for whom to pray! William and Elizabeth had no children and they were succeeded in their estates by Alexander, the son of William's brother, Anthony. Sadly, only nineteen years later, the Reformation acts abolished all chantries. The school and the almshouse remained, however, and it is likely that William's foresight in vesting the overseeing powers in an Oxford College rather than a monastery, has allowed many interesting traces of the chantry and the family to also survive.